Available in Standard size (as pictured) or in a Bullock Whip Size. The Whip Bag has been Made in Australia and will hold up to 6 whips. With nice lining inside it will keep your whips protected when traveling. The pouch on the outside is designed to store your leather conditioner, crackers & string, and tools. Also it has a space to write your name on the outside. This way you will never loose your whips at a competition! Available in Beige(Pictured), Black, Hot Pink & Camo. 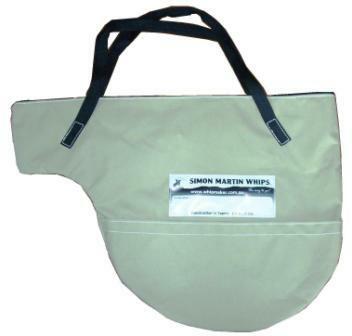 For other Whipcracking Accessories including whip crackers, falls, repairs kits, tools, etc...please see my other business website www.simonmartinwhips.com and purchase from there.